Have you Hugged your Library Today? This "Historically Speaking" column appeared in the Exeter News-Letter on Friday, April 13, 2012. As this week is National Library Week, it seems an opportune time to discuss Exeter’s public library. Not only does the Exeter Historical Society, from where this column comes, inhabit the old public library building, but library employees have a habit of haunting our archives after retirement. One of our current volunteers, and member of the Board of Trustees, is Pam Gjettum – who for many years was the head librarian in Exeter. Our former curator, and author of Exeter, New Hampshire: 1888-1988, was Nancy Carnegie Merrill, who served as reference librarian. Working at the historical society is to be in the constant presence of librarians, it seems. Exeter’s early libraries weren’t ‘public’ as a library is today. 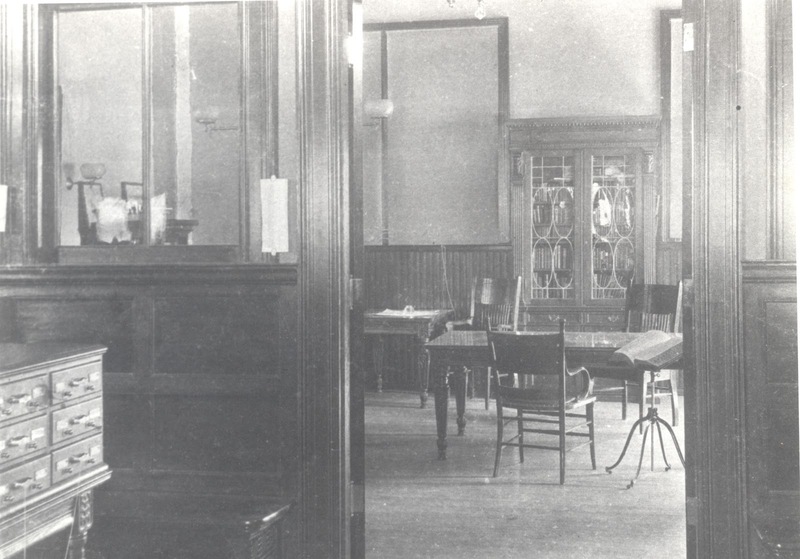 Social libraries were created by subscribers, who paid a fee to collect volumes. Exeter had several social libraries the first opened in 1779. These required incorporation, as they were business arrangements amongst the members. Oddly, they didn’t make provisions to add new books to the collection, and so they dissolved presumably once everyone in the group had read all the books. The first of these was called the Social Library, followed a few years later in 1797 by the more geographically specific Exeter Social Library. Both seem to have disbanded by the early 1800s. The Mechanick Social Library incorporated in 1815 when the word ‘mechanic’ still had a futuristic and scientific ring to it – much the same way we use ‘cyber’ today. The men who formed the Mechanick Social Library were largely professionals who were decidedly bookish. Once the social libraries died out, a new type of system developed called a circulating library. In this system, the local bookseller gathered a collection of books and charged a fee per book or annual rate to patrons. Henry Ranlet of Exeter was one such proprietor. His book collection was eventually sold in 1817 to Nathaniel Boardman. Boardman sold the collection to Francis Grant, who ran the circulating library from his shop on Water Street. Albertus T. Dudley, in a presentation to the Exeter Historical Society in 1943, said of Grant’s shop, “his store must have presented the appearance of an over-stuffed curiosity shop. (In 1829) he advertises 133 different articles which he ‘has constantly on sale at his bookstore.’ Noteworthy among them are quills; various kinds of paper and ink; wafers; black sand; pounce; water colors; slates and slate pencils; horn, wood, and ivory pocket combs; mathematical instruments; razors; soap; hairbrushes; steel mounted spectacles for every age; beads; violin and viol strings; clarinet reeds; battledores and shuttlecocks; backgammon men; dice; playing cards…” The list goes on and on as if Grant was the nineteenth century equivalent of Walmart. Keeping track of the circulating library must have been quite a task. Exeter’s first publically supported library opened its doors in 1853 at the old town house on Court Street (today the Exeter Senior Center). There was no Dewey Decimal system yet to classify and organize books, so patrons had to consult an alphabetical catalog to find the book they were looking for. Each book was assigned a number and it was this number that was submitted to the librarian when requesting the book. The librarian’s job was to check books in and out and protect the stacks (visitors to the library were not able to browse the volumes as we can today). The rules and regulations were strict. A family could only have two books at any given time. 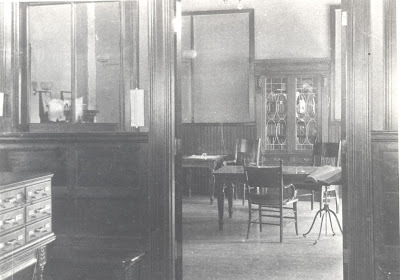 Fines were steep for the time – 1 cent per day for overdue books and 50 cents for any damage. The library was open only two days per week – Wednesday and Saturday. All books had to be returned in June for the annual inventory. Reference works could not be checked out of the library – which given the lack of seating made research somewhat difficult. But one of the final rules makes it clear that even though the dingy library room had all the ambiance of a drive-thru bank, it was still a place that drew people in. “Rudeness and boisterousness of deportment, and loud talking are positively forbidden; nor is the library open for the accommodation of Loafers or idlers; all violations of this rule will be summarily dealt with,” it read. By the late 1880s, the deficiencies of the library facilities were apparent. In 1892, the town approved $15,000.00 to build a new library building. The new library – which doubled as a Civil War monument – opened its doors on September 24, 1894. It still had closed stacks, but at least there were two large reading rooms available for patrons. The hours were extended to every weekday afternoon and evening. An addition was built onto the back of the building in 1942 to accommodate an expanded children’s room. Today, this serves as the archives for the historical society. In 1987, the library moved again to its current site on the river. It remains a vibrant place – probably a bit less quiet than it was in previous years – and still the place to gather for the love of books.